1.1 Students will be able to identify and describe the major principles of biology. 1.2 Students will be able to analyze critically and apply the major principles of cell and molecular biology. 1.3 Students will be able to analyze critically and apply the major principles of ecology and evolution. 1.4 Students will be able to analyze critically and apply the major principles of organismal biology. 1.5 Students will be able to integrate physics and chemistry concepts into relevant biological contexts. 1.6 Students will be able to apply knowledge of biology to one or more contemporary issues in society. 2.1 Students will be able to evaluate, interpret, and apply experimental design and draw valid conclusions from experiments. 2.2 Students will be able to analyze data quantitatively and develop testable models of that data. 2.3 Students will be able to evaluate and interpret data in scientific literature and other sources. 3.1 Students will be able to write effectively in multiple contexts within the discipline. 3.2 Students will be able to effectively communicate orally in multiple contexts within the discipline. 3.3 Students will be able to prepare and present, orally and in writing, to scientists in other disciplines and audiences outside the sciences. 3.4 Students will be able to collaborate effectively in a group setting within the discipline. 3.5 Students will be able to perform competently in a professional setting. Hello. I am Andrea Soles. 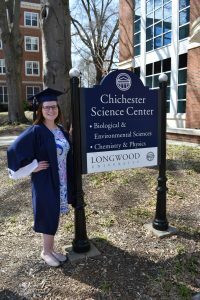 I am a graduating senior from Longwood University in Farmville, VA. I am getting my Bachelor of Science in Biology. This website displays my work that I have done over the past 3 years as a Biology major. It also includes my resume, cover letter, and personal statement.